Let us look at the pAsuram and its meanings, first. kadal kadaindhadhu enRu – when was the ocean (of milk) churned? enRu kadal kadaindhadhu – when was the ocean churned? The implied answer is that it was churned today. Have the waves and the agitation of the ocean stopped after he churned it? Do they not remain as they were? emperumAn has blessed AzhwAr such that he could see all that happened, is happening and will happen, all at the same time right before him! Thus, the great task that he had undertaken [of churning the milky ocean] appears to AzhwAr as if it has been carried out today. evvulagam nIrERRadhu – which world did he measure after accepting water? (Here too, the implication is that it is this world). Is there a world other than ours that he measured after accepting water? Is it not to protect this world that he went seeking alms, concealing his identity totally [as vAmana]? AzhwAr says that his foot print that he set out to measure the world has not disappeared. Is this world suffering because of mahAbali? (No) As said in thiruvAimozhi 4-4-1 “vAmanan maN” (the world measured by vAmana) it appears that this world is only his. onRum adhanai uNarEn nAn – AzhwAr says that from the day that emperumAn measured this world, we should have realised that and should have been talking this only. Instead of that, we are constantly engaged in and wasting our time in eating, dressing up and similar activities. Another interpretation is that instead of knowing such wondrous deeds of emperumAn, we are trying to establish emperumAn through conjecture. Another interpretation is that just as nammAzhwAr swooned and did not regain his consciousness for 6 months after reciting the verse “eththiRam” in thiruvAimozhi 1-3-1, poygai AzhwAr too goes into a trance after seeing his wondrous deeds. Reference to churning of ocean and accepting water [to recover the world] are pointers to all his deeds. anRu – did emperumAn not churn the ocean today? To AzhwAr, it appears that he has been churning the ocean from that day and is still at it. Though time keeps moving, to AzhwAr it appears that what was done yugams (ages) back is being done right now, due to his deep knowledge. Since thiruppARkadal is a little distance away from where he is, AzhwAr is calling it as adhu (that). adaiththu udaiththuk kaN paduththa Azhi – he built a bridge across the ocean with stone. He broke it with his bow (after killing rAvaNan). He reclined in that ocean. udaiththu also means destroy. idhu nI padaiththu idandhu uNdu umizhndha pAr – since AzhwAr is in samsAram, he calls the world which is near him as idhu (this). 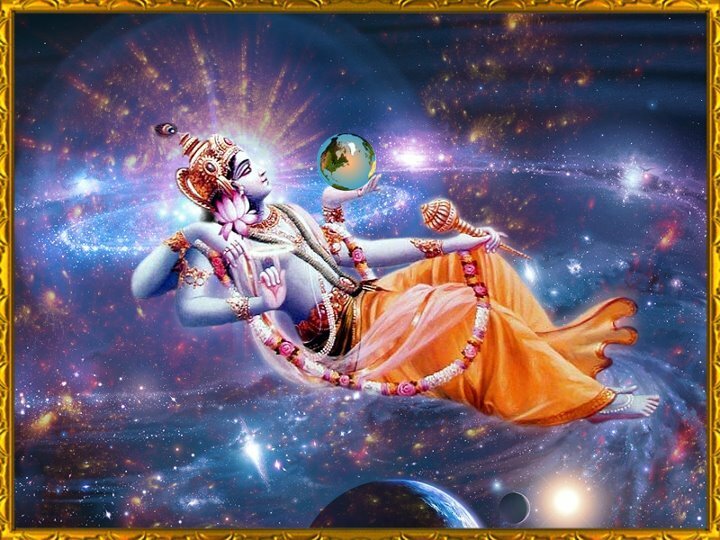 emperumAn created this world when it was not there; when it got drowned during praLayam (deluge) he dug it out; before the onset of praLayam, he kept it in inside his stomach to protect it; after praLayam ends, he spat it out this earth so that it could see all the galaxies. This earth has suffered a similar destiny that cotton suffers from the time it comes out as a flower till it gets converted into a cloth (paruththi patta panniraNdum is an old saying in thamizh which means the twelve processes that cotton undergoes before it becomes useful. Earth suffers like this at his hands). While other dhEvathAs call themselves as “Isvaran” (one who controls), if they are really Isvaran, would they not have taken the steps that he had taken to retrieve this earth? This alone is enough to understand that they are not Isvaran. Also, if this earth were indeed not his [emperumAn’s] would he have carried out all these actions? As nammAzhwAr says in thiruvAimozhi 4-5-10 “kaNdavARRAl thanadhE ulagena ninRAn” (he establishes that the world is his due to all his deeds). We shall see the 3rd pAsuram in this thiruvandhAdhi, next. This entry was posted in iyaRpA, mudhal thiruvandhAdhi on June 8, 2017 by T N Krishnan.